If you binge eat, you should know that there are tons of emotional and nutritional tricks and tools that can help you break the binge cycle. It’s not just about what you eat. It’s not just about how you feel. It’s not just about how you think. It’s about all of these. Sometimes I use this blog to share some of my most effective tips for ending emotional eating. Today I’m sharing one that’s tasty, fatty, creamy, and slightly sweet. It makes me think of tropical beaches and the time I almost got a concussion in the South Pacific. What in the world does coconut have to do with bingeing, you say? Sometimes we binge ’cause we’re hungry. Coconut is chock full o’ healthy fats that will help keep you fuller for longer, thus making binging less likely. Try adding coconut milk to your smoothie, sautéing your veggies in coconut oil, or sprinkling your breakfast oats with shredded coconut. Sometimes we binge ’cause we don’t have enough nutrients in our diet. Our bodies are hard-wired to seek out nutrients, and to eat non-stop until we get enough. That’s why fast-food meals leave you hungry (and nauseous) an hour after you eat them. 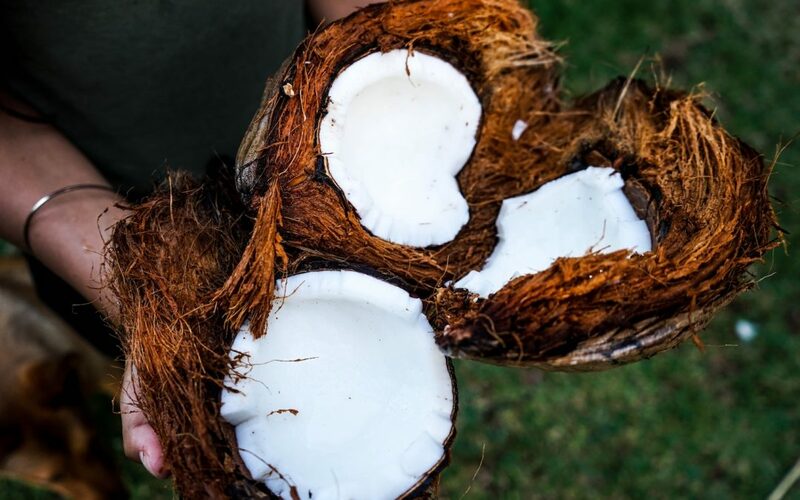 Coconut is a highly nutrient-dense food that your body will thank you for. Sometimes we binge ’cause we want sometime creamy and sweet. Oh come on…who doesn’t love creamy and sweet? In fact, there is an evolutionary explanation for our sweet-and-fat cravings. It’s important to know that sweet and fat, in and of themselves, aren’t bad!! The healthy forms of sweet and fat in coconut will both satiate your cravings and give your body some powerful nutrients to work with. Sometimes when we binge, we binge on nasty stuff, and that makes us smell funky. You smell how you eat, and armpit odor’s often a result of consuming a food or beverage that your body doesn’t like. Coconut oil to the rescue! It’s anti-microbial, so applying it to the pits kills the scent. I’m completely serious about this. In fact, I know from (cough) personal experience. Sometimes when we binge, we binge on sugar, and that causes yeast overgrowth. A diet high in sugar commonly results in excessive yeast in your digestive tract. This creates a lot of problems. Coconut oil to the rescue, again! It’s anti-fungal, so taking it orally and applying it topically to itchy spots can help kill the fungus among us. Bottom line: we’ve been brainwashed to fear fat and calories. Coconut’s high in both, so most of us tend to avoid it like the plague. Ironically, it’s a food that can help you combat your cravings – and clean up the aftermath of bingeing – in many ways. Please – give yourself a tropical treat and include coconut on your grocery list the next time you go shopping!